INCLUDES AN EASTER EGG HUNT at 11 A.M. The Great Delaware Kite Festival, co-sponsored by the Lewes Chamber of Commerce and the Delaware Division of Parks and Recreation, takes place at Cape Henlopen State Park on Good Friday, April 14, 2017. For the past several years, event organizers have noticed a trend toward participants’ later arrival times. 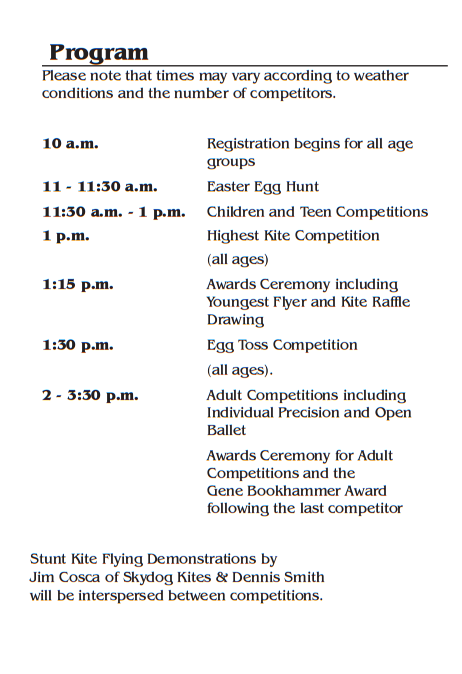 In an effort to maximize attendance, the schedule was changed two years ago to reflect the attendance pattern and included an Easter Egg Hunt at 11 a.m. to kick off the day, followed by the kite competitions for children and teens. The highest kite competition follows at approximately 1 p.m. and is open to all ages. Another new activity added was an egg toss competition that will take place again this year immediately after the highest kite contest. The adult competitions will begin at approximately 2 p.m., interspersed with professional stunt kite flying demonstrations. Note that the times may vary according to weather conditions and the number of competitors. Registrations begin at 10 a.m. with ample opportunity for kite competitors to practice in the fields adjacent to the competition area. All of the activities are free including the Easter egg hunt and the egg toss. The Easter egg hunt will be limited to children up to the age of 12 and the egg toss teams can be multigenerational. The kite competitions are in three age categories: Children-Up to age 12; Teens-13-17 and Adults-18 & older. Within each age category, kite flyers are judged by the type of kite they are flying — home-made or store-bought. The Special Class awards include the Open Individual Ballet (free flight performance accompanied by music which the entrant provides), Individual Precision (compulsory figures including “The Square,” “The Mount,” and “Ladder Down” judged on technical execution), Most Senior Flyer, Youngest Flyer, Flyer Furthest From Home, Smallest Kite and Largest Kite. The Highest Kite Award category is open to all ages. Entrance fees apply for cars to enter Cape Henlopen State Park which will be collected at the entrance to the park - $5 per car for Delaware license tags and $10 per car for out-of-state tags. The Jolly Trolley will transport spectators at no cost to the competition field from the state park’s beach parking lot and handicap parking is available at the Seaside Nature Center parking lot. For those who have not made their own kites and want to participate, Kids’ Ketch and Rehoboth Toy & Kite Company will be on-site selling a wide variety of kites with ample space, adjacent to the competition field, to practice in advance of the competitions which begin at 11:30 a.m. Additionally, there are food vendors, a face painter and community organizations set up surrounding the field.